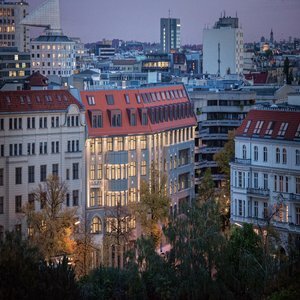 Following an extensive renovation after first opening as a hotel in 1913, this luxurious boutique hotel in Berlin opened its doors again in 2013. It is uniquely located within walking distance of West Berlins main attractions and the famous shopping boulevard, Kurfuerstendamm. Occupying a tranquil position in a picturesque residential neighborhood, this Berlin boutique hotel is surrounded by various theater and opera houses. Contemporary interior design blends with the historic Art Nouveau building and creates a charming, intimate atmosphere. This boutique hotel includes 84 stylish guestrooms and three suites on six floors and one restaurant & bar offering local cuisine with regional products and drinks. Other features are an exclusive spa on the top floors of the hotel, a fitness room overlooking BerlinÂ´s skyline and two private meeting rooms on the ground floor. Hotel am Steinplatz joins a number of Autograph Collection properties currently scheduled to open in Europe.